For guests using a GPS please use the coordinates 35.041815 -85.686825. Google will only be able to navigate to our hotel if those exact coordinates are entered including periods commas hyphens and addition signs. Thank you and we look forward to your arrival. Welcome to the Hampton Inn Kimball hotel. 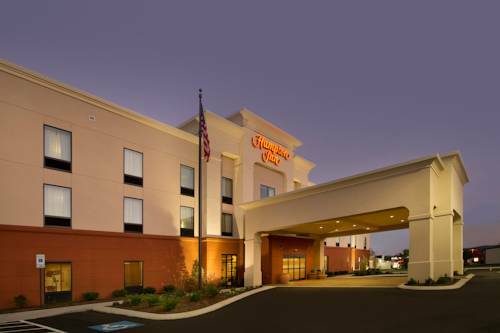 Ideal for both business and leisure travelers this modern Tennessee hotel enjoys a central location just off I-24 in the Kimball/South Pittsburg Area. Catch up with work in the 24-hour business center and make use of A/V equipment rental printing and copying services. Host a business or social event for up to 50 guests in our modern meeting room and use free high-speed internet access available throughout the hotel. If you prefer the convenience of working from your guest room use the handy lap desk to work while you recline on the clean and fresh Hampton bed. Start each morning at this hotel in Kimball TN with Hampton*s free hot breakfast. Choose from a delicious variety of hot and cold buffet items or try one of our famous fresh-baked waffles. We also offer hearty oatmeal with a choice of toppings for a tasty healthy option. If you*re in a hurry grab a free Hampton On the Run Breakfast Bag available Monday through Friday. Maintain your fitness regime with an energizing workout in the free fitness center or simply relax with a dip in the seasonal outdoor pool. Pick up snacks drinks and microwavable meals from the 24-hour convenience store or treat yourself to some popcorn to enjoy with a movie in your guest room. Friendly service clean rooms comfortable surroundings every time. If you*re not satisfied we don*t expect you to pay. That*s our commitment and your guarantee. That*s 100 Hampton. We*re known for providing a friendly home away from home atmosphere in our old country store and restaurant and there*s good reason for that. Our food us great. That*s where Domino*s comes in. Domino*s delivered over 400 million of those pizza*s last year. That*s just over one pizza for everyone in the US. Our delivery people drive more that 10 million miles every week to bring you the best pizza we can make. Offering the world*s best breakfast biscuits and giant thick burgers at Hardee*s we*re here to serve you. If you have questions or concerns please let us know how we can help. A little bit of Italy in the heart of South Pittsburg. Seven secret spices make it the world*s best fried chicken. Rafeal*s is a local chain out of Chattanooga and it doesn*t get any better. Chef*s Pizza Meatball Subs and Greek Salads are favorites. We opened our first restaurant in Boardman Ohio way back in 1964. Back then getting a freshly sliced expertly made sandwich was important. And to us it still is. That*s why we still hand-slice all of our sandwiches every day in every single one of our restaurants. ~21 miles from South Pittsburg. ~20 miles from South Pittsburg. ~59 miles from South Pittsburg. ~62 miles from South Pittsburg.